Érica Ambrosio on Getting in the mood for Halloween. lauren on Getting in the mood for Halloween. erica on for hecks sakeness!!! Lisbet on for hecks sakeness!!! Susie on for hecks sakeness!!! I am so old! HA HA HA!! Just had to jump on really fast to post something completely, 100%, cute. and a bday coupon code for my store. No, I am not 25 years old; it is for 25% off in my Store. HERE. Good for 1 time use per user for today and tomorrow. Now the cute story and pictures. So, then I ran around with the kids getting all their last minute Halloween things together, and buying things for their class parties. My son had swimming lessons, we grabbed some quick dinner, and came home to get ready for bed. After all the bedtime stuff, I received the best presents EVA! My two older kids (ages 7 and 5) had been sneaking around earlier in the paper and pens. I figured they were drawing me pictures, but I had no idea how awesome and fun they'd be. I just love it! 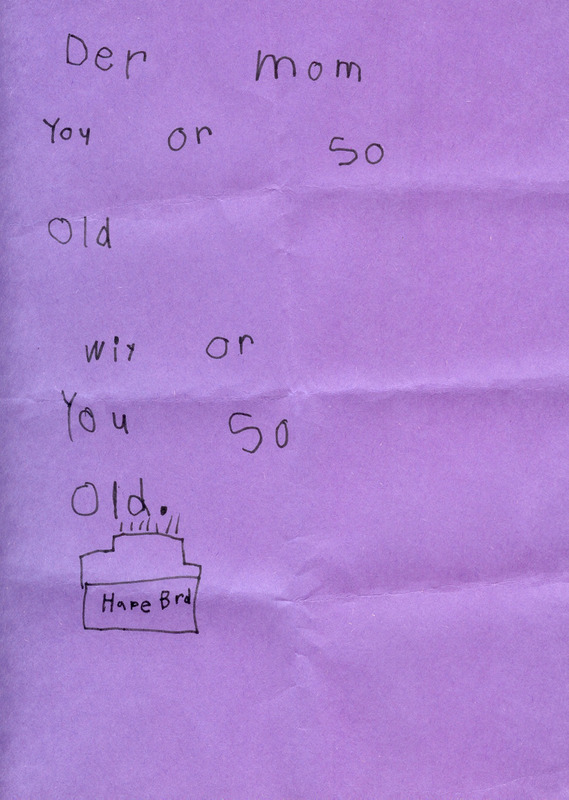 Other than it is from her, she just barely started learning to read and write, and I love how she sounded out the words (with her big brothers help). 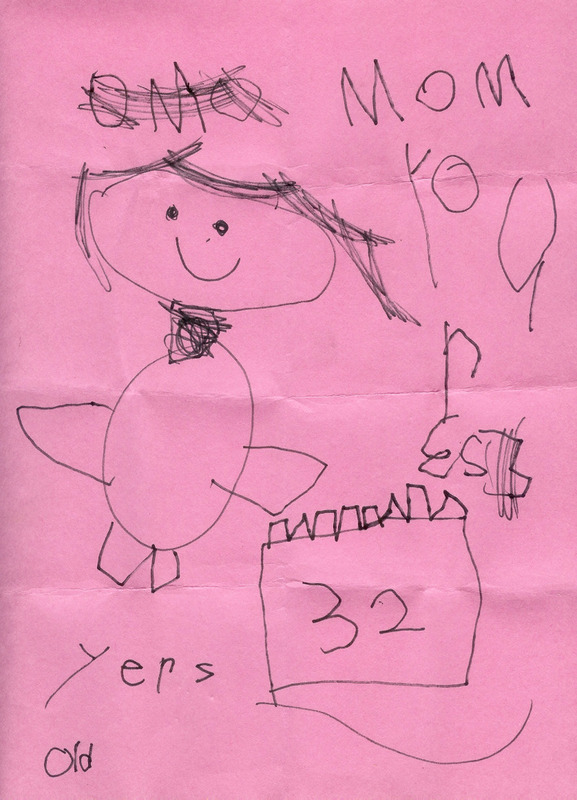 If you are not used to reading inventive spelling this says, "Mom, you are 32 years old." It is fabulous! It is awesome, too. I love the personal writing from him. 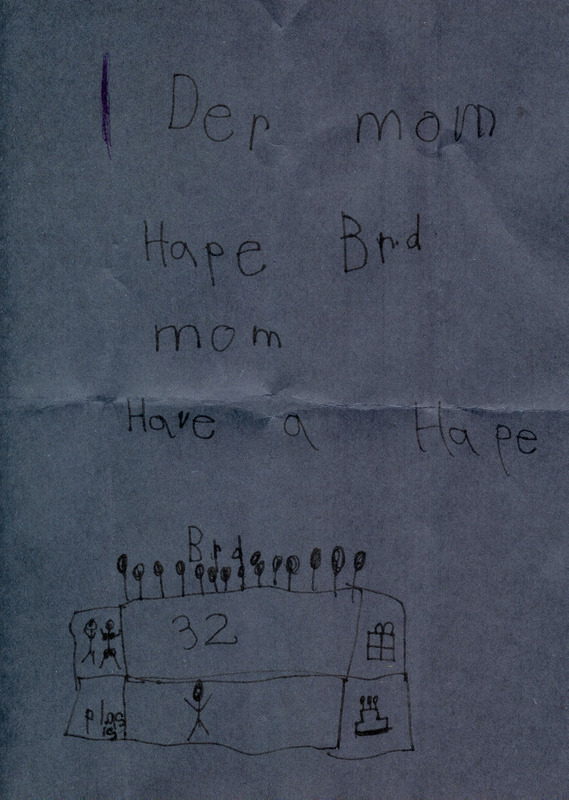 "Dear Mom, Happy Birthday, Mom, have a happy birthday." BUT this is the BEST ONE ever! ROFL!!!!!! Did you understand that!! OM GOSH!! dh and I were laughing so loud. "Dear Mom, you are so old. Why are you so old? Happy Birthday!" seriously! "you are so old!" HA HA HA!!! I love it! It would make a great bday card! LOL!! Well, I hope you enjoyed that. and had a good laugh! Don't forget about the coupon code. :) Good through tomorrow! :) Happy day! Some new digital things!! Wahoo! Getting in the mood for Halloween.